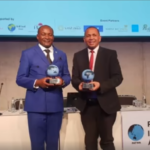 Video: Namibia’s Minister of Environment and Tourism, Pohamba Shifeta receiving a much coveted international tourism award in Berlin. FLYING the flag high for Namibia and for Africa in general, the country’s efforts to develop and market it as a premium tourism destination over many years have not gone unnoticed. Namibia was today awarded the Best Destination Safari and Wildlife at the Pacific Areas Travel Writers Association (PATWA) Awards. The awards ceremony was held in Berlin, Germany. Additionally, Mr. Pohamba Shifeta was just awarded Tourism Minister of the year in the emerging destination category. In his acceptance speech, Shifeta expressed gratitude to PATWA for recognising Namibia’s efforts in conservation for tourism development. “This will encourage us as the authority and our stakeholders to do more to stop the poaching of high value species like our elephants and rhinos,” he said in his acceptance address.